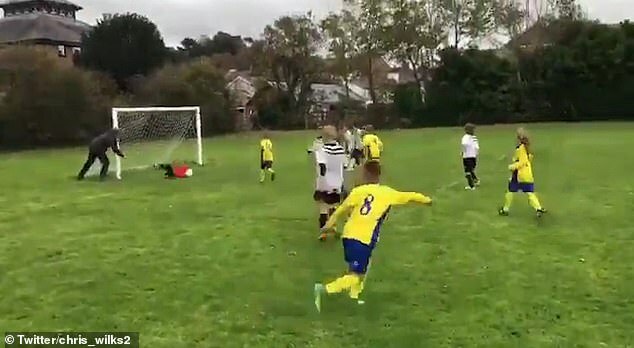 This is the shocking moment a father pushes over his own son to help him save a goal during an Under-8s football match. The footage, filmed in mid Wales, shows the man shoving the young goalkeeper in the direction of the ball. 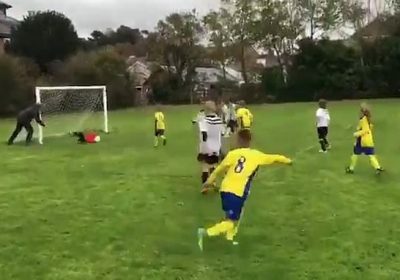 Although the boy saves the initial shot because of the push, another player scores from the rebound prompting the goalkeeper’s father to turn away in disgust. 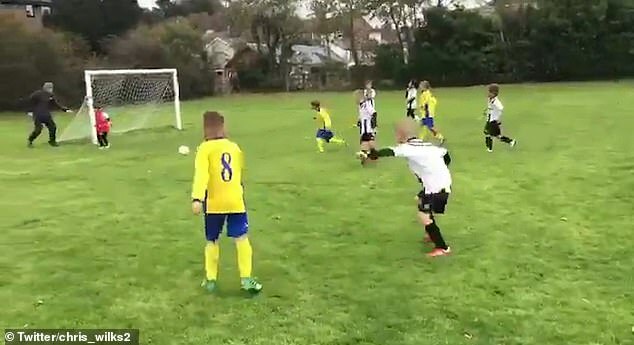 The video was uploaded to Twitter by Chris Wilkins who said that the match was between Bow Street Magpies FC and Ysgol Llanilar FC. It has now been viewed more than six million times. The start of the clip shows the opposing team running towards the goal where the young goalkeeper can be seen receiving instructions from his father. The man is stood right behind his son and seems to be distracting him as the opposition take a shot. The goalkeeper is completely oblivious as he pays attention to his father rather than the ball. Incredibly, the man then shoves his son over so that he lands on top of the ball and blocks the shot. Unfortunately, the other team then score the rebound as the stunned child lays on the floor. His father turns away in disgust, throwing his arms in the air angrily as he walks away from his son. The opposition celebrate the goal as the boy lays prone on the floor in surprise.